There are few more iconic images in cinema than Frankenstein’s monster rising from the operating table or, in its sequel, his bride standing straight and horrified, with the lightning shock of white through her towering hair. In fact, they might be so iconic that no one watches the movies anymore – we already know what happens. Specifically, the monster rises from an operating table, and his bride has crazy hair. Done and done. I made sure to include these in the list because I honestly can’t remember if I ever watched them from start to finish. They both played on regular rotation on television throughout my childhood – Sundays, Channel 20, in the afternoon, along with westerns and a grab-bag of other old films the network had been able to grab cheaply, one presumes. I remembered them like dreams, or like pictures I saw on someone else’s mantel, in a house I haven’t been to in a while. Watching them now, I learned a few things: 1) Bride is significantly funnier and better than the first one; 2) director James Whale did a fairly honest transposition of Mary Shelley’s novel, making the monster more a tragic than a diabolical figure; and 3) even from the start, horror movies have been intensely concerned about gender, identity, and transformation. 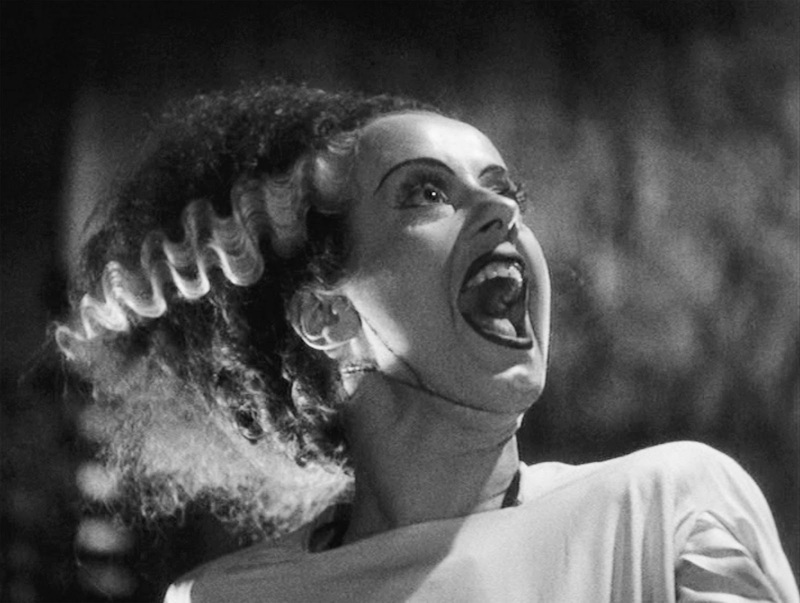 Bride of Frankenstein significantly improves on the rather by-the-numbers adaptation of Frankenstein. To its credit, it attributes the story to “Mary Wollstonecraft Shelley;” in the original, it says it’s based off a tale from “Mrs. Percy Shelley,” which is fucked on a number of levels. That’s not the only nod towards feminism in the film (not to mention basic decency), but it’s comforting to see it on the screen first thing. There’s not much to talk about in the story – Frankenstein’s monster desires a companion, his creator wants nothing to do with it thanks to the earlier murders, a mad scientist is only too happy to help – but it’s a structural masterpiece (built around Mary Shelley, slyly knitting before a fire, telling Lord Byron and her husband the rest of the story, which she says she hadn’t yet published), and the script gives everyone plenty of room to breathe. 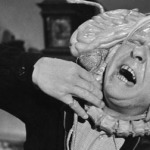 It’s far less stilted than the original: the monster’s efforts to gain language are funny, his failures to communicate are poignant, and the transformation scene at the end deserves every bit of its fame. Whale, an openly gay man in early Hollywood (and so something of a rarity), made these classics of misunderstood outsiders, inherently suspected “deviants” rejected and misunderstood by mainstream society, who piece together identities, struggle to define themselves, and long for community in a hostile world. Throughout the month, the movies I watched kept coming back to these themes, in overt and oblique ways. Horror – located in the body, seeking to generate visceral thrill, concerned above all with flesh, its vulnerability and capacity for transformation – lends itself particularly well to symbolic treatments of questions of identity and sexuality. In Frankenstein and especially The Bride of Frankenstein, these questions bounce around without being answered, but both films make a wise decision: they treat them in passing, and focus on presenting something new and fun and relatable and scary. The themes are so crucial to the genre that they don’t need to be underlined – they’ll always be there. We couldn’t avoid desire if we wanted to. Fine, 26 Horror Movies For October!